Developed by Zombie Studios. Published by Atlus. Released April 29, 2014. Available on PC (reviewed), PS4. 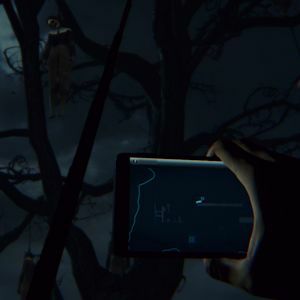 The recent rise in popularity of horror games is thanks in no small part to the increasing influence of YouTube celebrities. Young men shrieking at allegedly scary games is big business right now, and it stands to reason that game makers themselves would be interested in getting involved. The viral spread in notoriety of Amnesia: The Dark Descent and Slender has spawned all manner of copycat experiences, all cynically vying for a chance to be screamed at by PewDiePie or that other one. While I'd hate to accuse Zombie Studios of similar cynicism, it's hard not to raise an eyebrow at the terminally unambitious Daylight, a game that comes off as coldly constructed YouTube fodder, following in the footsteps of previous cult horror games with an almost religious loyalty. At best, Daylight is a pedestrian rehash of long-established horror cliches, and at worst it's a desperate pretender to Slender's dubious throne. In Daylight, you wander around slightly randomized environments, picking up arbitrary pieces of paper while avoiding a ghostly entity. The more items you pick up, the more frequent the "shadow" attacks, dealing damage to the player whenever it's directly looked at. Does that sound familiar? It should. It's the premise of Slender and the hundreds of games that followed in its trail. Disappointingly, this publisher-backed, extensively marketed game seems content to never expand upon an idea cobbled together by one man two years ago. It may offer a slightly longer running time, but when each stage of the game is basically the same thing, that hardly says much in its favor. Zombie's efforts are clearly of higher quality than the other Slender wannabes out there - it at least features textures and animations, which is a rare treat in this subgenre - but there's simply no meat on its bones. It's just another "me too" horror game, and it's too predictable to even be particularly frightening. I have no problem with jump scares - in fact I defend them as a legitimate horror trope - but a bad jump scare can be absolutely awful, and Daylight's are never good. There's no build, no pacing, no mounting tension that a successful jump scare needs in order to succeed. Instead, the dreary identical corridors are content to sit there in silence, occasionally throwing a loud noise at you, or making a door open. The ghost is more annoying than scary, shrieking obnoxiously at you every few seconds, sometimes spawning in front of your face in a manner that looks more amateurish than ethereal, and chasing you around when all you want to do is try and make sense of the uninformative in-game map. The fact you can use flares to scare the ghost away only further reduces any sense of threat the game might otherwise cultivate, and while Daylight promises that "no two playthroughs are the same," the limited number of setpieces and generic environments sure as hell make everything feel identical. The randomized structure is used to justify its two-to-three hour running time, but my playthroughs have all, so far, felt exactly the same. There's a vague plot to try and hinge some semblance of investment on, but like everything else, it's pillaged from existing, more interesting fiction. It's set in an abandoned hospital, with spooky ghost girls, unethical doctors, and all the other associated stereotypical scenarios. The protagonist constantly whimpers about how scared she is in a cloying bid to convince the player they're just as terrified, and a John Noble impressionist offers obfuscating allusions via the player's cellphone-turned-light source. As for the big twist at the end ... I think "embarrassing" is the word I'd use - not just for how obvious it is, but for how it's sold to us as the most shocking revelation this side of The Usual Suspects.